This beautifully finished Victorian four/five bedroom detached house occupying three floors has been seamlessly extended giving an eclectic mix of old and new. The spacious double aspect lounge opens onto wide south facing patio terrace garden and orchards. The bespoke well appointed kitchen has vaulted ceiling and polished concrete flooring with boot room, separate utility and cloakroom/wc. To the front is double aspect dining room with bay window to along with separate study. The first floor accommodation provides sumptuous master suite with en-suite shower room and walk-in wardrobe. 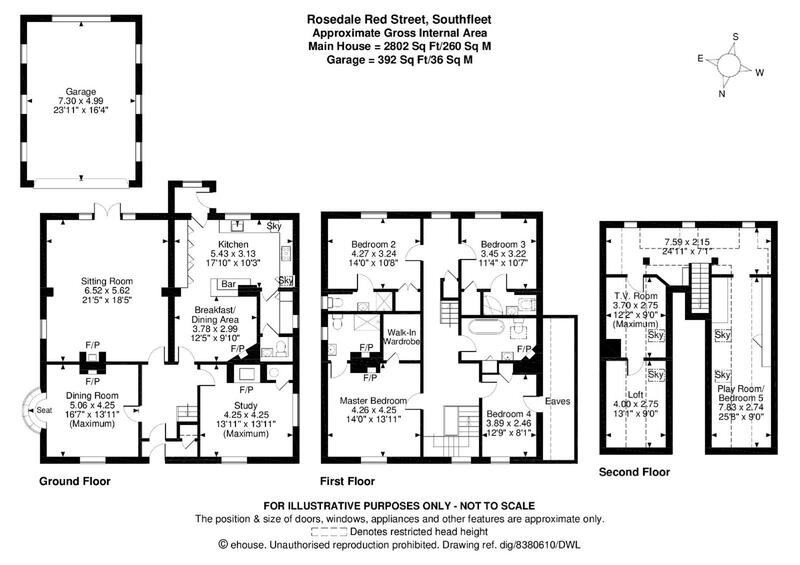 There are two further bedrooms en-suite, family bathroom and fourth bedroom. The second floor provides a children’s play/TV room and further room perfect for guests. Outside is carriageway driveway with access to both sides of the house one ideally suited for boat or caravan secured via double gates. The other driveway leads to further parking area and double garage. The established south facing gardens lead to further secluded patio and orchards all of which back onto open farmland. Southfleet is a delightful semi-rural village offering local primary school, church, public house and farm shop. Ideally situated within easy access of the village of Longfield and Gravesend town centre providing further shopping recreational and educational facilities including mainline railway stations to London Victoria and Charing Cross respectively. The A2 and M25 motorways together with Bluewater, the Channel Ports and Ebbsfleet International station providing a 20 minute link to London St Pancras are also within easy access. From Fine & Country North Kent proceed down Ash Road towards Longfield, at the mini roundabout turn right onto the Main Road. Once past the three schools on the right hand side take the second turning left into New Barn Road. Follow the road down, on entering the village of Southfleet, turn first left into Red Street opposite the pond where the property will be found a short way along on the left hand side. “When we first viewed Rosedale, we were immediately taken by the wonderful original features, open fire places, generous space and the fabulous garden which was ideal for our family,” say the current owners. “The half acre garden is like another home during the summer. The patio areas are ideal for BBQs and parties, and there is plenty of space for the children to run around, camp and play football. The fruit trees provide a bumper harvest to make jams and chutneys, including Victoria plums, cooking and eating apples, damsons and sloes.” The greenhouses and outbuildings provide storage for garden equipment, bikes etc and is very secure which is perfect for pets. We are informed this property is in council tax band G, you should verify this with Dartford Borough Council on 01322 343434.